Assessments and Diagnostic Instruments: We offer a variety of leadership diagnostic tools, interaction-style indicators, and organization climate assessments, all of which enable participants to gain increased self-awareness, a more accurate understanding of their leadership capabilities, and the organization dynamics influencing their effectiveness. Simulations: Our training programs use simulations that will put participants in real-life scenarios, allowing them to hone their skills as savvy communicators, effective team builders, and entrepreneurial leaders in their organizations. Executive Coaching: As part of our services, participants have the opportunity to receive one-on- one coaching to help deepen their understanding and personal application of leadership principles. Individual coaching significantly accelerates the development of leaders at all levels of the organization. Immersion Learning Experiences In Mission-Critical Competencies: Our sessions are customized to support individuals and their organizations through a wide range of in-person and virtual learning opportunities, including team-based projects, case studies, simulations, and field visits. Action Learning Projects: As they build their leadership portfolio, participants have the opportunity to develop and implement a project that meets their organization’s priorities, apply what they learn, and immediately demonstrate value added to their organizations. 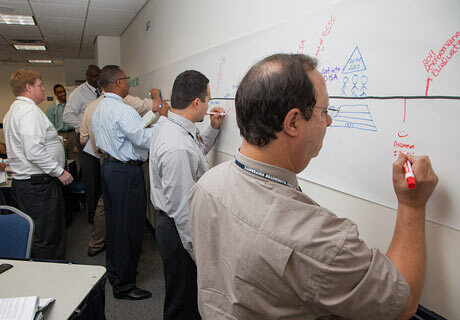 Project-Based Leadership Development: Through our extensive and advanced capabilities in designing and facilitating project-based leadership development experiences, we are able to accelerate the development of leaders who are savvy and effective change agents, while at the same time achieving significant results that make a difference for their organizations. Action Learning/Peer Coaching Circles: We skillfully facilitate peer learning and coaching sessions using a wide variety of proven leadership approaches, including action learning, appreciative inquiry, and others. As part of the sessions, participants acquire key leadership skills such as coaching and asking powerful questions, while also receiving support for the leadership challenges they are experiencing. "The process mapping used in Six Sigma was eye-opening to us in identifying where are the gaps in our process, so we can better address them." "The fact that they tied it together where you were learning as a group, building skills as a group, but you also were attached to an executive coach to give you more individualized attention was pretty amazing, it was great foresight in terms of the program coordinators and developers." "I can credit the IRE/REDP program for encouraging me to continue my work in local government and to pursue additional education and training to further develop my leadership skills."